10in x 12in .025 metal sign with rounded courners and 1/8 in mounting holes. 42 magnificent and colorful EMD diesel freight and passenger locomotives that burnished the rails of Americas Railroads throughout the 1940's and '50's..... all in their official as built company artwork. 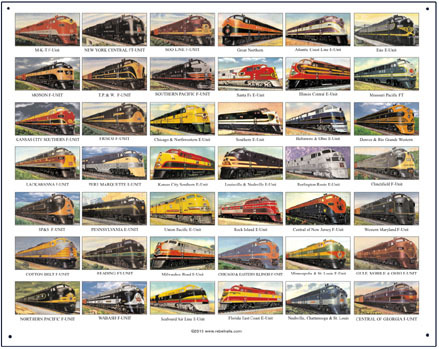 Just about every major American Railroad is represented from the Atlantic Coast Line on the East Coast, to the Union Pacific Railroad on the West Coast. Click on above image for zoom.